Jasnagra Public School, Akola has advertised in THE Lokmat newspaper for recruitment of PGT jobs vacancies. Interested and eligible job aspirants are requested to attend interview on 31st May 2018 .Check out further more details below. 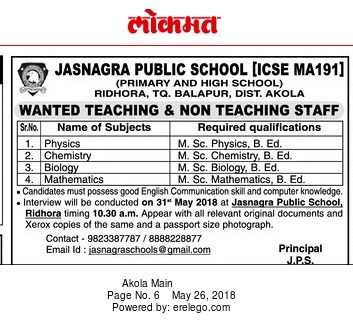 Name of the School: Jasnagra Public School, Akola. About School:Jasnagra Public School aims at the integral personal formation of the students. Here, student life is not solely concerned with academic pursuits but also provides plenty of additional development criteria opportunities such as preparing them for competitive exams, sports, Co-curricular activities, local excursions, etc. JPS creates ample scope for children to construct their knowledge through the social interaction. The teaching – learning process, games, activities, projects are so well designed keeping in knowledge that ‘ALL’ Children should be equally involved in the transactional process. How to Apply: Interested and eligible candidates may attend interview will be conducted on 31st May 2018 at Jasnagra Public School, Ridhora, timing 10.30am.